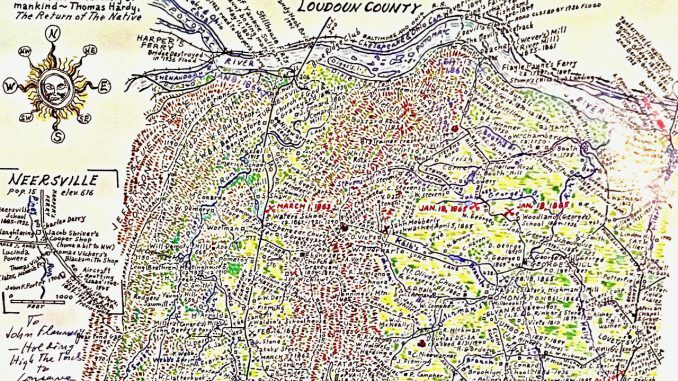 Loudoun County’s pre-eminent map-maker and historian, Eugene Scheel, will discuss the making of his latest map on Sunday, October 15, 2017, as part of the Lovettsville Historical Society’s monthly Lecture Series. Mr. Scheel’s new map highlights historic features in the Short Hill area between Lovettsville and the Blue Ridge. Mr. Scheel started his latest map in April 2016, in the midst of the public controversy over AT&T’s plans to enlarge its telecommunications facility on top of the scenic Short Hill mountain, just west of Lovettsville. With help from a number of old-timers from the area, Mr. Scheel walked and drove the entire area, locating sites of historic interest, such as where skirmishes and fighting took place during the Civil War, and old roads, sawmills, and graveyards. Even though he had hoped to finish it quickly because of the heated controversy over the AT&T construction project, he didn’t complete the map until last September – still a significant accomplishment, which he says was only possibly because of his work in the early 1970s on his famous historical map of the entirety of Loudoun County. Having worked previously for National Geographic and Rand McNally, Mr. Scheel has devoted decades to map-making and historical research in Loudoun County and the Piedmont of Virginia. He has drawn over 50 historic maps, and has written nine books on local history. He will have many of these maps and books available for sale and autographing at the Lovettsville lecture. The program, originally scheduled for May 21, will be held on October 15, 2017 at 2:00 p.m. at St. James United Church of Christ, 10 East Broad Way, Lovettsville, VA. Admission is free, but donations are welcome to defray expenses of the program and to support the activities of the Lovettsville Historical Society.